It's almost a week since MS Dhoni announced his retirement from Test cricket. To be honest, it didn't surprise me at all. It was inevitable. He had to go. He was never a great Test batsman. He was never a great Test captain. He was not made for Test cricket. But somehow he managed. Superb at home, terrible overseas. When he first arrived in the International arena, he wasn't considered good enough for Test cricket. He wasn't that great behind the wickets. But his swashbuckling unbeaten 183 against Sri Lanka in an ODI at Sawai Mansingh Stadium changed it all. He single-handedly led India to victory. This knock earned him a place in the Indian Test side. Like most part of his Test career, he didn't set the stage on fire in his first series as a Test player. His first major knock came against arch-rivals Pakistan in their own backyard. That Faisalabad 148 will go down as one of his finest Test knocks especially when you consider the circumstances and the quality of Pakistan bowling attack which included the likes of Shoaib Akhtar, Mohammad Asif and Danish Kaneria. I would like to add two more knocks to that list - his gritty 99 against England in Nagpur and a match winning 224 against Australia in Chennai. In that order. I rate that Nagpur knock higher because it was exactly opposite of his natural game. He had completely shut the shop during his 398-minute stay at the crease. We don't see that Dhoni often. That Chennai double came in a tricky situation. India could have conceded a first innings lead but his partnerships with the tail prevented it from happening. This brilliant counter-attacking knock boosted the morale of the whole team and probably set the tone for rest of the series. He should have stepped down as captain after a series of losses in England and Australia in that 2011/12 session. He didn't. There was no real contender to challenge him. Dravid retired. Laxman retired. Dhoni continued. Stalwarts were replaced by newbies. The guard was changing. India lost to England at home. Whitewashed Australia. India's favourite son Sachin hanged up his boots. Last one of the golden generation cricketers. Dhoni remained immune to changing circumstances. Indian cricket was going through a transition period. It was Dhoni's responsibility to leave the team better and stronger than the present. He stayed there. Despite all the criticism. Despite limited resources. He took a young team to South Africa, New Zealand and England. There was a sign of improvement. Batsmen were scoring runs, bowlers looked a little more competitive. Brilliant in patches, ordinary mostly. India managed to win just one Test on these tours. Their only away win in 3 years. Should have won more, should have done better. More often than not Dhoni let the game drift. Some of his tactics were baffling. With every passing game, more critics were emerging from every corner of the street. From team selections to field placements to bowling changes. Everything under severe scrutiny. Every step judged. Dhoni's post match pressers reached ridiculous heights. Comments like crisis 'nowhere close to 2007 World Cup loss' were common. It appeared as if he didn't even care anymore. He only talked about process, always happy with the performance. Result didn't matter to him. Captaining in Test cricket is a tough job. Captaining India in Test cricket is a tougher job. Captaining India in Test cricket with limited resources is the toughest job. Dhoni gets injured ahead of the Australia series. A lucky break for Virat Kohli. He replaces MSD as captain, leads the team well, scores twin hundreds and almost pulls off a win while chasing a 350-plus target on a 5th day Adelaide wicket. It earned him a lot of praise from experts and ex-cricketers. Ajinkya Rahane and Murali Vijay continued with their good overseas form. Both batted with some great confidence and looked more mature. Ready to take India to new heights. The guard was changed. India lost the series but the transition was complete. The 'process' was successful. Indian Test team was in the safe hands. Dhoni knew his time was up. 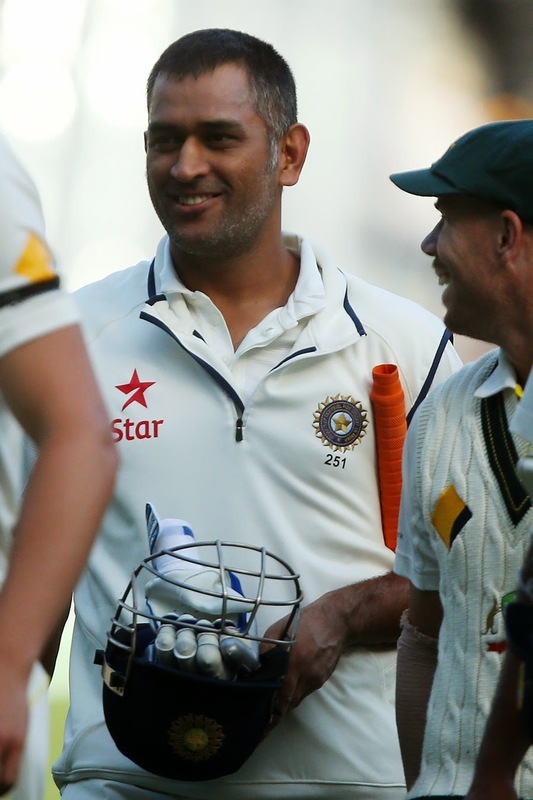 MS Dhoni ends his Test career as the most successful Indian captain. Won 27 out of 60 matches and has scored more runs than anyone else doing the job. Despite all his weaknesses, he played 90 Tests for India. That's an achievement in itself. No.1 ranking as a Test team, levelling series in South Africa, Chennai double hundred, whitewash of Australia and Lord's win were his finest moments under the sun. Indian Test team will miss this 'punching bag' especially in the post match pressers. "All his cricketing life MS Dhoni has been obsessed with keeping the emotion out of it. He was never going to make leaving an emotional act. No farewell Test, speech or even press conference. Boom. Gone"